They Might Be Giants is just about my favorite working band, and not just because they’re also the only band — apart from the Byrds, many many years ago — with whom I’ve actually worked a show onstage and back stage. TMBG are smart and good and nice and funny. And live in Brooklyn. Really: what more could one want? Here’s their new video, Electric Car, from their brand new album Here Comes Science. Please enjoy. 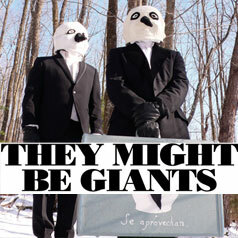 They Might Be Giants dressed up as...penguins? snowmen? All I know is that these guys crack me up. If you’re ever in a room with They Might Be Giants, one thing’s for sure, watch what you say! At the Aspen Ideas Festival, Kurt got the chance to talk to band members John Flansburgh, John Linnell, and Marty Beller about their hilarious list of phrases that “nobody in the band is allowed to say.” TMBG compares expressions like “jump the shark” and “phone tag” to old chewing gum — so overused that they have lost their flavor. Of course the list itself is now on the list. *No worries enjoys a unique “workplace dispensation” where it can be used with a co-worker to help decompress a work situation. Click here to listen to the interview, or to leave a comment and share which phrases you think should be on the list! On July 4th, Kurt caught up with They Might Be Giants‘ John Flansburgh, John Linnell, and Marty Beller at the Aspen Ideas Festival and found out why the sun really shines. (The special show airs on Studio 360 this weekend.) Not in attendance were John and John’s sock puppet alter egos – the delightfully orange emcees of the They Might Be Giants’ Friday Night Family Podcast. If you haven’t checked out the podcast yet, you’re in for a treat. I may have mastered my ABCs and 123s long ago, but I still get a kick out of a puppet dressed like George Washington. Also in this episode (from President’s Day weekend 2008) a psychedelic ode to the always under-appreciated number two.